We’re recently back from a month in southern California. Stayed in Dana Point, which is just a bit south of the more well-known Laguna Beach. Have to say, it’s pretty nice down there. A series of beaches up and down the coast, and plenty of nice hikes into the dry hills inland. Plus, if you’re willing to do some driving, you can make it to the high desert in a few hours. We took a jaunt through Joshua Tree, and further on to Death Valley, (by way of Vegas, baby). No fires where we were this year – but plenty of haze on the horizon. I didn’t make an effort to research if that was normal, or if we were seeing the smoke from up north? 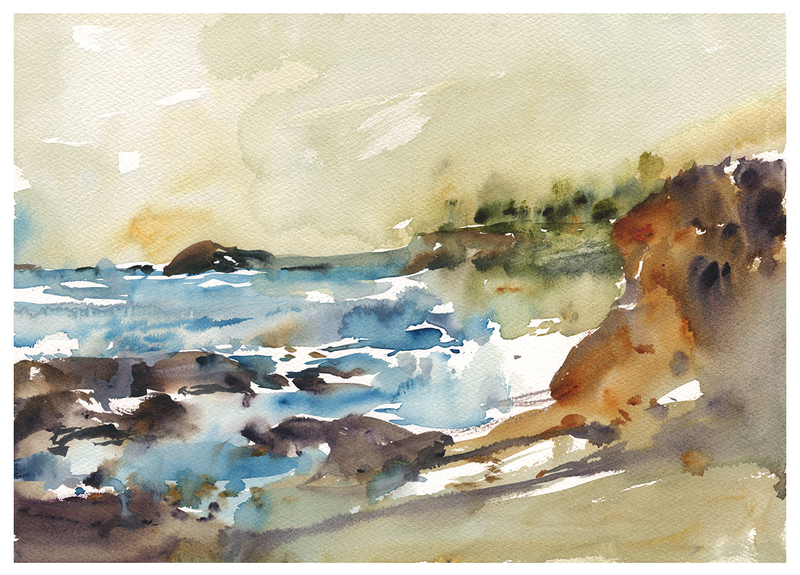 These beach sketches are the very spirit of Direct Watercolor. Not much planning, other than a single scrawled pencil line for the big shapes of rocks and water. They’re painted all in one go, because, even though it’s arid in SoCal, down by the water the paper doesn’t dry fast enough to work in layers. Though, even without layers, I still progress from larger to smaller shapes, working a silhouette from outside-in. Going light to dark pigments, and wet (tea) to dry (honey) viscosity. The paper is still soaked when I begin to touch in opaque-ish darks. Which is fine. They blend without needing to pull edges. It’s a bit challenging, painting on the beach, trying not to get sand into everything. The first day I took too much gear, and found it annoying juggling drawing boards, water bottles, brush case and assorted junk – without letting anything touch the ground. Did anyone play a kids game ‘the ground is lava!’? You had to move around the playground without touching the ground. Or at least, only for a fast 1-2-3 count. Hah! These sketches are from a second day. I cut down my gear, brought only two gold handle Escoda Reserva pocket brushes. (<that’s an affiliate link, thx). One large (#12), one small (#6) round. Plus a couple of drawing boards, and my pocket paint-box. There’s a couple shots of this setup in this NYC trip, except, using Rosemary pocket brushes. It can be tricky getting small details over damp paper. In this one above, I was trying to put a line of trees onto the cliff in the background, but the sky was still too wet. We get an interesting ‘blotchy’ effect which actually helps the ridge in the look further away. (I think so anyway). A happy accident. Here, I did the sky as the next-to-first thing (the sandy grey base tone of the cliff was very first). That way, after painting the water and rocks, the treeline could be the very last thing – maximizing my sky’s drying time. Also worth noting – the cliffs here are crowned with rows of houses. Beautiful places, that look like someone’s doing very well for themselves. This time, I left all those glittering mansions out. In the past I might have focused on the houses, with their walls of glass and private staircases zigging down the cliffs. But, tiny, complicated architectural forms are not suitable to this bold, direct painting approach. And I’m getting less and less concerned making an ‘accurate’ depiction of the place. These might have been at Aliso Beach, Victoria or Thousand Steps (which is only 295 by my count). I can’t recall which exactly. We visited a lot of spots, that, while each are different, you could go to the same place at different times of day or with different tides, and it would be a new painting every time. ← Tasty Watercolor Fish in a few easy steps! I love these- they are so spontaneous and lively! 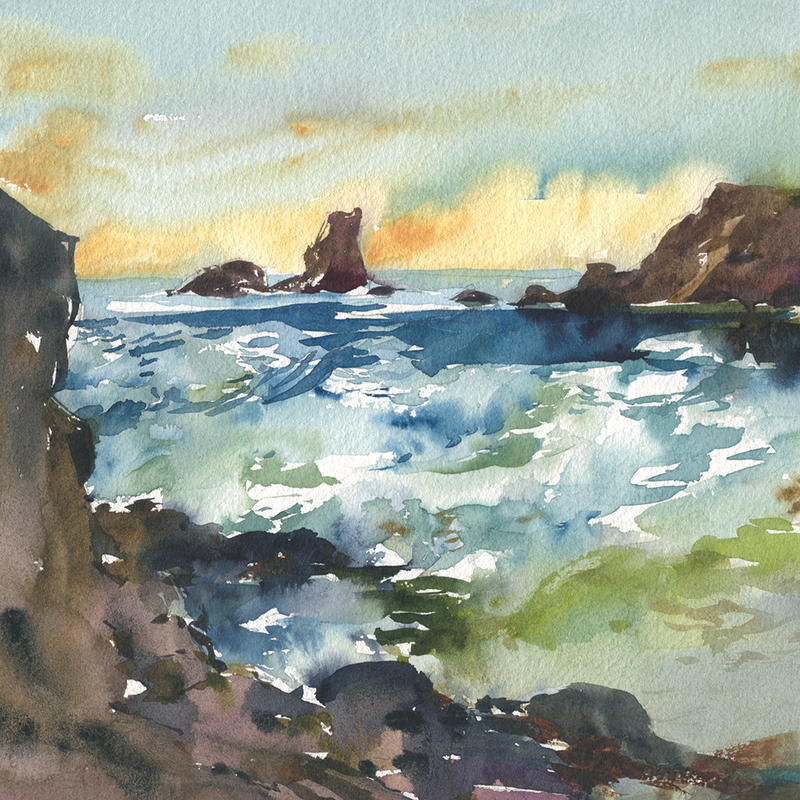 wonderful sketches capturing the beauty of the coast…..I know! The reddish haze was from the fires – usually the skies over the ocean are clear or result from local weather. The beach was probably 1000 Steps, short in actual steps but at least that many in lore. These are gorgeous. You are so skilled at getting vibrant colors while working with wet paper that remain vibrant after drying. Your color combinations are beautiful! They really made each other sing! What is the yellow that you used at the skyline, the deep blue? Thanks! Thanks Cathy :) I have Naples yellow, Nickel Titanate yellow and maybe there was some Quin Gold. The powerful blue is called Turquose, from MGraham. Thanks Marc! I really like your rich color combinations, and I appreciate your tutorials and blog posts! A plein air master! Love the rich blues. Thanks for posting Marc. I love these. I just got home from two weeks in Dana Point. So sorry that our paths did not cross. Every time I see one of your posts, Marc, I am inspired to quick-sketch and paint. My New Year resolution (which is silly, since I rarely stick to them) is to focus principally on drawing and quick-sketching in January, and also to spend about a week on each of my art technique books (and then donate them to the library when I’m done, unless they are treasures that I must keep). I have a tendency to read the first parts of each book, then put it down, and forget to get back to it. Hard to stay out of the paint, though! Hi Marc. Wonderful sketches. I know the area well. I was once exploring a cave near Laguna when the tide started coming in. I didn’t know I could run that fast over sand and rocks! Hah! Feet don’t fail me now! Beautiful juicy washes of colors! They are wonderfully luscious. What are the sizes? Thanks Bernadette :) – and these are 1/4 sheets, 11×15″. Your paintings literally take my breath away. I love them so much. Hi Marc – your work is just beautiful! I’m a graphic designer, and was hoping we could have a conversation about potentially licensing an old sketch of yours (of the George-Étienne Cartier Monument) for a book cover. Please let me know if this would be of interest to you. I can only ditto what has been written. Fresh and lively paintings. You’ve really made the water move. I can’t imagine a whole month’s vacation. Lots of time to paint. Looking forward to seeing more of the work you did there. Marc, I’m so happy I discovered your beautiful plein air work. I live near Laguna Beach and your loose style really captures the wonderful ocean and the maginificent blues. What are some of your favorite blues in your palette? I adore indigo. Yes, I love indigo, and I’m using Turquoise from MGraham. I tend to mix with Grey of Grey sometimes for sky / water. Also, – Lovely part of the world you live in! Hey Marc! I’m taking your travel sketching class on “Craftsy”, which led me to your web site. I live about ten miles from Dana Point. I agree, it’s a beautiful place, filled with sketching & painting opportunities. Your paintings wonderfully capture the feeling of the place. 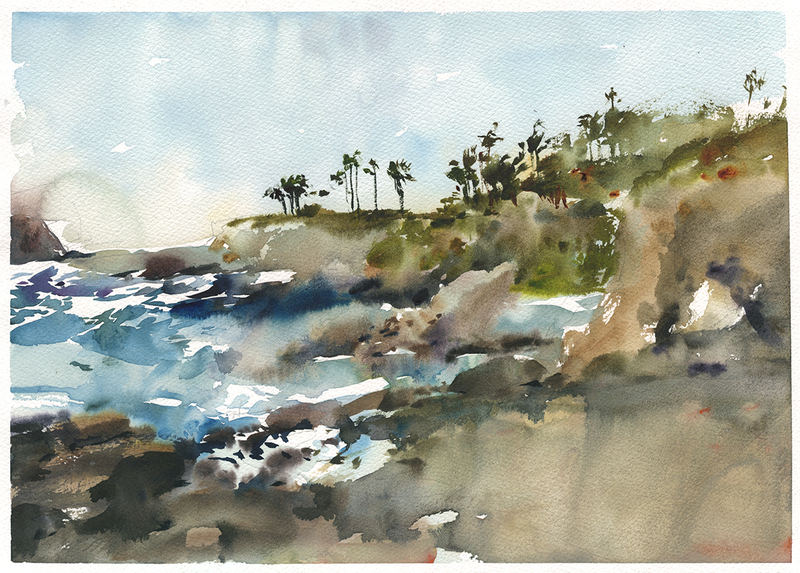 Loved seeing your paintings of Dana Point – where I have gone to often in the past. We live in the mountains near Lake Arrowhead and Big Bear so it’s great to read somebody who has visited a lot of the areas I have – and painted them. Beautiful work! Your paintings are fabulous! I love drawing sea paintings. It really inspires me. These paintings are really amazing. I love all the color and texture! It really makes the image pop.